The holiday season is quickly approaching, and movie lovers are getting excited for all the Christmas specials coming to television! Hallmark’s Christmas Next Door is one highly anticipated movie, and we’ve got all you need to know about the Christmas Next Door premiere! It’s that time of year again! For many people, the snow is falling, and local Christmas markets are opening for families and friends to gather together and enjoy the festive foods and drinks of the season. But if you’re not the adventurous type and want to cozy up with your cat and watch holiday movies, you’re in for a treat! Each weekend before Christmas, you’ll be delighted to find countless holiday movies on the small screen for you to watch! One such movie features a famous hunk, and a gorgeous blondie, and it plays a twist on a classic Christmas story. Curious to find out more? Keep on reading and you’ll find out why this holiday movie is in high anticipation. The cast of Christmas Next Door has been announced, and fans will be happy to hear that Jesse Metcalfe will be playing the Scrooge of the show! The Christmas Next Door cast will also star Fiona Gubelmann, when it debuts on Saturday, December 16, at 8 p.m. ET. This won’t be Metcalfe’s first rodeo. He’s a face you’ll remember from many romantic comedies and dramas including the TV series Passions; John Tucker Must Die; Beyond a Reasonable Doubt; TV series Desperate Housewives, Chase, Dallas, and Cheesapeake Shores; God’s Not Dead 2; and Destined. As for Gubelmann, the beautiful blonde is known for her roles in Employee of the Month, Blades of Glory, World’s End, TV series Wilfred and One Day at a Time, and Surprise Me!. Their two characters are quite different when they meet, but the holiday spirit may once again prevail over his cold heart! You’ll have to watch to find out! 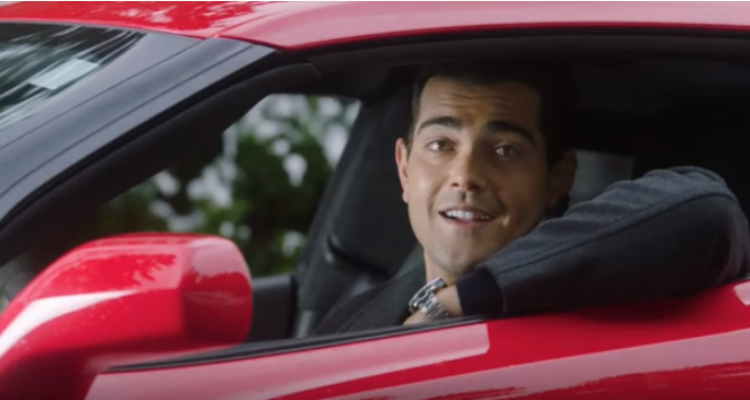 @realjessemetcalfe & @fionagubelmann star in the next #CountdowntoChristmas premiere of #ChristmasNextDoor! The two will team up on the small screen in a TV movie about two unusual neighbors who grow fond of each other. The synopsis reads: “At first glance, next-door neighbors Eric Redford (Metcalfe) and April Stewart (Gubelmann) couldn’t be more different.” Eric is a proud bachelor, a successful author, and loves his flashy, loud car and guy’s nights. April teaches at-home violin classes, and wishes every day could be Christmas. When Eric is put into a situation that forces him to get a little festive, he meets April, “who is at her own professional crossroads and fearful about an upcoming audition for the symphony.” The two help each other out, and Eric slowly reassesses his hatred for the holidays and experiences the magic of Christmas. Will he give up his bachelor life for holiday romance? You’ll have to find out by watching Christmas Next Door! In THREE hours @realjessemetcalfe & @fionagubelmann join us for a #CountdowntoChristmas Facebook Live! Would you like us to ask Jesse and Fiona about #ChristmasNextDoor?! The cast members will also include actors like Jacob Blair (Steve), Brittany Bristow (Elaine), Joy Tanner (Dana), Andrew Jackson (Bruce), Eugene Clark (Nick), Tara Yelland (Bridget), Mary Long (Sarah Redford), Christian Potenza (Ryan), Kevin Claydon (Jack), Evan Cleaver (Ted), and Liam MacDonald (Liam). If you’re ready for some holiday fun, check out the preview below for a sneak peek of the Christmas Next Door trailer! Excited yet? Tune in on Saturday, December 16, at 8:00 p.m. EST to watch the movie!